Decapod crustaceans include all the well-known edible and commercially important species such as the shrimps, prawns, lobsters, crayfish and crabs. 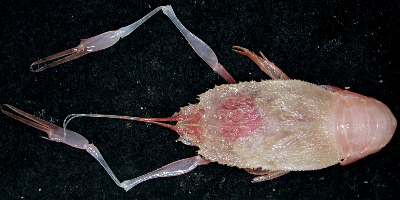 Decapoda literally means ten-legs, and takes its name from the five pairs of legs on the thorax, which can be variously modified as claws, walking legs or swimming legs. Decapods are primarily marine, but have colonized most environments, from the abyssal depths (including hydrothermal vents), to the intertidal, freshwater and even some terrestrial habitats. The order is estimated to contain nearly 15 000 species in some 2700 genera, with more 4000 of those species occurring in Australia. Most decapods are scavengers and typically live near the ocean floor, although some shrimp groups live in open ocean waters. They are either filter feeders, or capture their prey with sharp raptorial claws. Decapods are most diverse in the shallow tropics, but are nevertheless common in temperate shelf and slope waters and a few groups have become deep-water specialists. 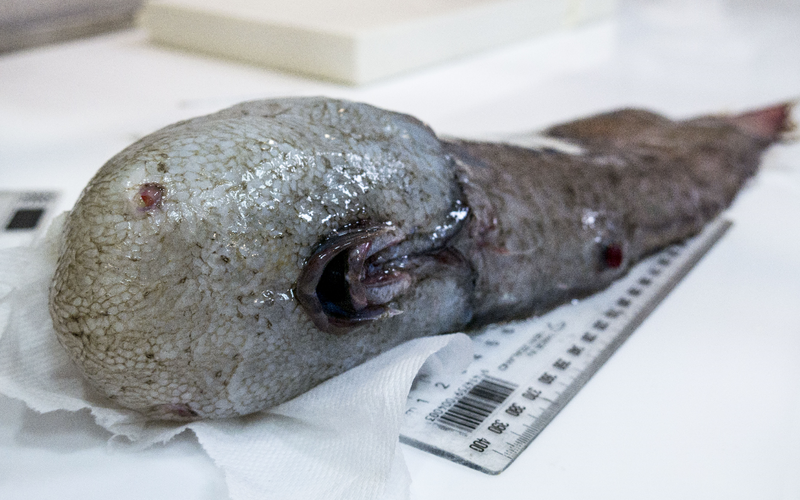 It is these that we have come to find as we trawl from the continental slope (2500 metres) down to the abyssal plain to depths of 4000 m and beyond. The decapods captured all belong to typically deepwater families or genera represented worldwide. 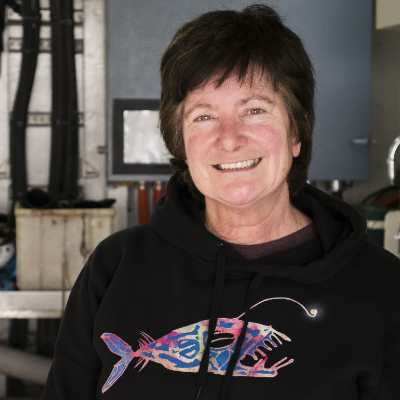 These deep-water specialists include several families of squat lobsters and deep-sea hermit crabs, king crabs, deep-sea 'blind lobsters' and several families of shrimps. 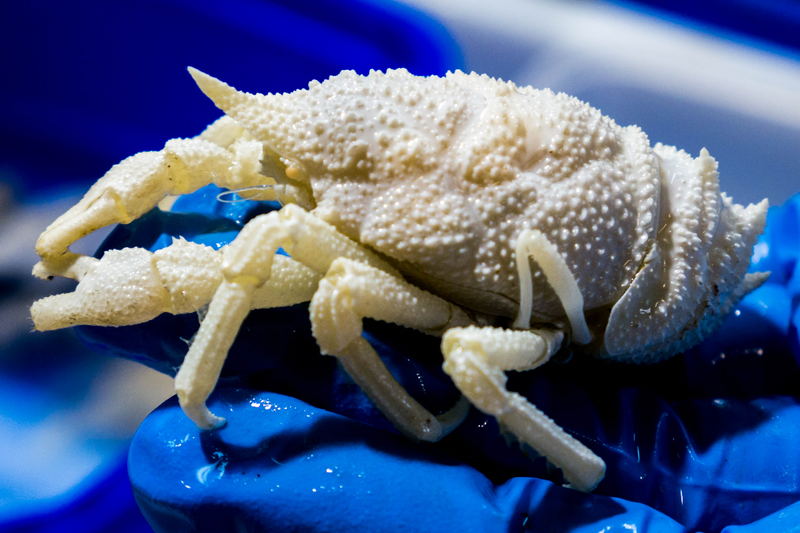 A few families of 'true crabs' (brachyurans) have become deepwater specialists, but these are generally confined to the continental slope at depths of 1000 to 2000 m. Indeed, few crabs are found in the abyss, although there are some rare exceptions such as the Spiny Masking spider crab, which takes the world record and has been found down to 7000 m! We have not found any Spiny Masking crabs so far on this voyage, but we did find some in recent deep trawls of the Great Australian Bight. 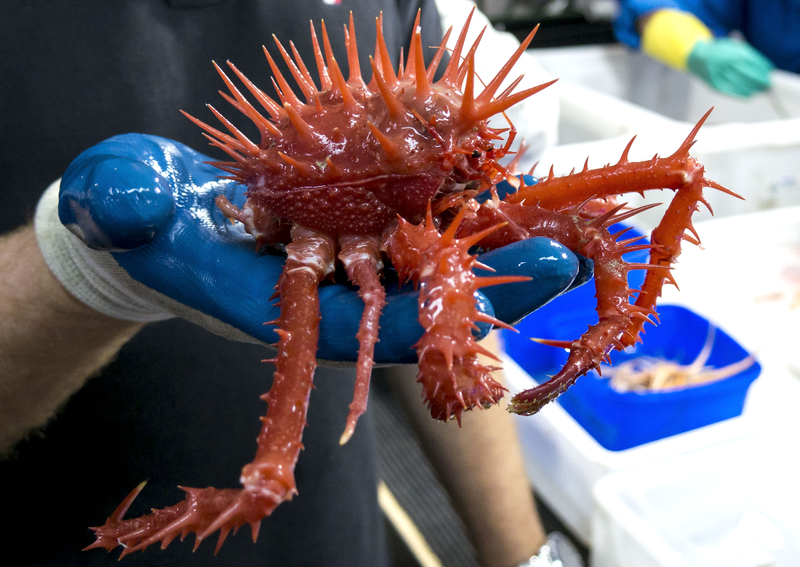 The decapods have been mainly found in the beam trawls and come up in a general mangle of brittle stars, sea cucumbers, worms, molluscs and sediment, but are readily detected due to their generally bright red colour. The haul of specimens is brought inside where they are sorted, put on ice, given an identification label, weighed and then photographed. They are then preserved and stored in ethanol. Some specimens require further identification work under the microscope, but once the ship starts to roll so do the specimens and further microscope work becomes nigh impossible without the risk of losing one’s breakfast. I am working the 2:00 am to 2:00 pm shift and go to bed exhausted each afternoon, but we all feel the excitement and adrenalin rush when a new haul lands on the deck and we can’t wait to see what has been revealed for the first time to curious human eyes. Thanks to Karen Gowlett-Holmes for providing these specimen photographs. Day 16 note from Asher Flatt: We reached our next sampling site off Newcastle this morning and put down a beam trawl to 4000 metres. Meanwhile, we were treated to a tour of the ship's engines by Genna, the RV Investigator's Russian engineer. There was much excitement once the trawl came up as more faceless fish came up with it, some of which were nearly see through. The faceless fish played a starring role tonight in an ABC TV news story about our voyage. The rock crab could go well as a garnish, with olives and lemon slices on its spikes! But looks very scary, would not like to step on one! Hope the sea sickness is wearing off for the microscope work. What an amazing experience! How weird and fabulous Caroline! I don't suppose those were on the dinner menu that night? !! Don't know how you're feeling but I'm hoping this goes on for some time. The discoveries are so impressive and beat any scifi film. Sleep well and keep the blogs coming. Thanks for the amazing work and pictures, so fascinating to see one of the last ecosystems for us to study. A great blog which touches on the fascinating work that you do and are involved with. Sounds and looks amazing !